From the era of the church districts competing with each other, through the continuous expansion of reformed institutions and the strengthening of the unity in the Carpathian Basin, in the last 18 years we arrived at the community of churches looking for its future – the outgoing Presiding Bishop, Gusztáv Bölcskei evaluated the events of his three terms in a row on the 15th, closing session of the 13th Synod. Bishop Gusztáv Bölcskei looked back on not only his past 6 years, but also his three cycles as a bishop in the opening speech of the session of the 13th of November, which was the cycle closing session of the Synod. The mandate of the bishop of the Transtibiscan Reformed Church District terminates at the end of the year and he is eligible for re-election during the ongoing church elections. According to the Presiding Bishop of the Synod, the first cycle between 1997 and 2002 was highly affected by the regime change in Hungary and its impacts, as the changing church was searching for its place in a changing world. The church leader thinks that these years were characterized by “schismatic effects and manifestations”, and by the ecclesiological false doctrine of viewing the Reformed Church as loose association of church districts. The bishop stated that the unity in the Carpathian Basin was being endangered by personal ambitions. Many times disputes in Synod Sessions became personal, and a significant number of synod representatives even boycotted sessions. Bishop Bölcskei noted the rapid expansion of the reformed institutional network and offering of unconventional services – the pastoral care in camps, prisons and hospitals – on the positive side of the era, as well as the manifestations of domestic and international (including the Carpathian Basin) solidarity at times of crisis – for example in 1998, when the flood in Transcarpathia devastated the people living there –, furthermore the appearance of common liturgy and hymnbooks. The Presiding Bishop highlighted the introduction of the church’s new financing system and the fact that the relationship with the state changed due to the treaties, agreements and the common protestant public events – like the ecumenical worship on the eve of the public holiday on the 20th August or the Reformation Month. Bishop Bölcskei added: the Synod frequently receives critiques for not fulfilling its teaching call. After examining the period in question, however, it is clear that the synod does not only fulfill its legislative tasks but it stated its point of view in several theological-societal questions during the years. “We wanted the enthusiastic and spontaneous development after the regime change to be followed by normalization and transparency” – said the Presiding Bishop of the Synod in retrospect to the period between 2003 and 2008, according to which this synod cycle shaped the reformed unity in Hungary and more so in the Carpathian Basin. As he stated, by making the sessions of the Presidency Council of the Synod systematic, introducing the new committee structure of the Synod, and having a lot of new co-workers who are committed to the church and professionally prepared, the conditions for accountability and transparency were created. In this period the Reformed Church transformed from a responsive church into a church willing to initiate resolutions and dialogues and the church districts realized that “it is not them who have a church, but it is the church that has districts”. In this period, several establishments, inter alia, the Hungarian Reformed Church Aid, the Reformed Mission Centre, the Reformed Network of Foster Parents and the Hungarian Reformed Solidarity Fund were created. The Starpoint Youth Festival was also initiated, the form and nature of world forums were changed, and the church started to have thematic years, from which – according to the Bishop – the Year of the Bible and the Year of the Family had the most influences. The international relations of the RCH were strengthened, besides the General Convent was formed, that shaped the reformed unity in the Carpathian Basin and adopted a common constitution of the Hungarian-speaking reformed churches. The Presiding Bishop of the Synod noted: this was also a period of fighting for the institutions of the church in a political headwind. The third cycle, it between 2009 and 2014, were connected by the Calvin Memorial Years. The goal of the Synod’s work was to build unity, strengthen the community and to enforce the Presbyterian principle more effectively. In connection to the latter, the Bishop highlighted: we always emphasize the Presbyterian Principle but its enforcement proceeded only to a small extent in the previous cycle because the cooperation between civil organizations – e.g. the Hungarian Reformed Presbyterian Association and Hungarian Reformed Women’s Association – and church bodies did not deepen. The Bishop interpreted the setting-up of the Church Revision Committee as a step towards strengthening the community. The Committee, in compliance with its mandate, prepared its discussion paper for the cycle closing Synod session. In connection to the Calvin Memorial Years, the theological-scientific work had gotten more vivid: the volumes of the Parochial Library were released; the revised Bible with new translation was completed as well as the new release of the Institutes and the Heidelberg Catechism Commentary. The Bishop said: the communication of the RCH has broadened, although the new methods raised tensions multiple times in the community of the church. Bishop Bölcskei phrased the introduction of the mandatory teaching of religion and ethics classes, as “not sought but accepted”. In this matter the church districts, for the first time, reached a common standpoint that the administrative tasks related to the project should be organized in a national scale. Bishop Gusztáv Bölcskei told us that church sociological surveys were initiated; the editing of the hymnbook is under way, there is a preparation for a modern catechism; and the revision of The Second Helvetic Confession can also be realized. He added that: a significant transformation in the education is expected to happen and the contract made with the State in 1998 has to be actualized. 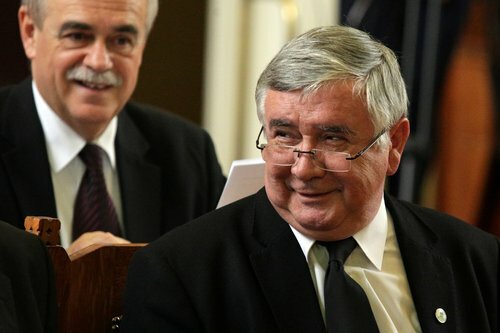 In connection to the cooperation in the Carpathian Basin he noted that in the last cycle the dynamism, which lasted to the Constituting Synod in 2009, seems to have abated. According to the Bishop, the relationship is lively in many areas but “there are church districts that spectacularly disregard” the work of the General Convent. This became apparent when the Carpathian Basin church body’s last session – which took place in Sepsiszentgyörgy – was not attended by representatives of many church districts. 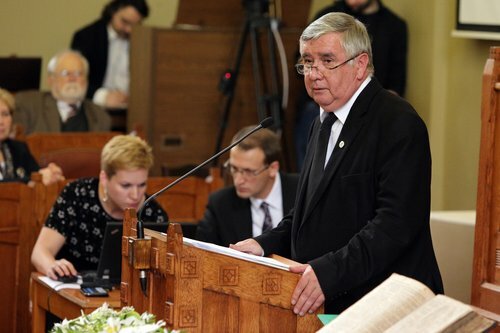 “Although cross-border cooperation had positive effects in the past” – Bishop Gusztáv Bölcskei warned about the importance of the case.